Bangalore is most commonly known as India's IT capital. However, the city is also said to have more than 1,000 temples and places of worship. They've been constructed over the years by different ruling dynasties, dating as far back as the Cholas in the 10th century. While many have important histories, others are more modern. Here are top temples in Bangalore, as well as ashrams, mosques and churches to visit. If you'd prefer to be guided, consider this Full Day Private Tour of Bangalore's Temples. Travspire conducts an insightful and recommended half-day Bangalore Temple Tour too. Bangalore's Sri Radha Krishna ISKCON temple is one of the largest ISKCON temples in the world, dedicated to Lord Krishna. The temple was completed in 1997 and sits atop a seven-acre hill, known as Hare Krishna Hill, at Rajaji Nagar in north Bangalore. It's been designed as a huge cultural complex to promote Vedic culture and spiritual learning. The unusual architecture fuses classic Dravidian and contemporary styles, with a traditional gopuram (tower) and glass panels. At night, the complex is evocatively illuminated. The temple is open for worship on Monday to Friday from 7.15 a.m. to 1 p.m. and 4.15 p.m. to 8.15 p.m. It's open the whole day, from 7.15 a.m. to 8.15 p.m., on weekends and public holidays. Ceremonies with chanting are held in the main hall every 15 minutes. Visitors can participate, and have discussions with teachers afterwards. The evening aarti ritual at 7 p.m. is followed by kirtan, where devotees sing and dance. Tickets, starting from 300 rupees, can be purchased for entrance to various parts of the temple if it's crowded. The heritage neighborhood of Basavanagudi in southwest Bangalore is home to many old temples, one of which is the famous 16th century Bull Temple (Dodda Basavana Gudi). This Dravidian-style temple was built by Vijayanagar ruler Kempe Gowda, who established the city. It gets its name from its star attraction -- a massive monolithic Nandi (Lord Shiva's bull) that's carved out of granite rock. The temple is situated inside Bugle Rock Park and is commonly visited along with adjoining Dodda Ganeshana Gudi. This temple has a large monolithic idol of Lord Ganesh. The ancient rock formations in Bugle Rock Park are an extra attraction. Try and catch the annual Kadalekai Parishe groundnut festival that takes place during November or December, when farmers offer their first groundnuts to the sacred bull. Kempe Gowda also restored the Gavi Gangadhareshwara Temple (meaning the Cave of the Lord who Adorns the Ganga) in Gavipuram, not far from Basavanagudi. This Shiva temple is remarkable for being cut into rock and its special astronomical significance. About an hour before sunset on Makar Sankranti (January 14 or 15 each year), the sun's rays pass between the horns of Shiva's bull and bathe the temple's main idol in light. This popular spectacle is called Surya Majjana, or Sun Bath. Another of Bangalore's old Shiva temples, Someshwara Temple sits alongside Ulsoor Lake and is believed to have been founded during the Chola era. Notably, it's centuries older than the city it's located in! The temple was also extensively renovated by Kempe Gowda in the 16th century and its gopurams (towers) added then. Inside, the temple's 48 intricately carved pillars belong to the Vijayanagar era too. The carvings on the temple walls, some of which depict Shiva's marriage to Parvati, are a highlight. The temple is open from 6 a.m. to noon and 5.30 p.m. to 9 p.m. daily. Its worth heading out to Begur, next to Hosur Road on the southern outskirts of Bangalore, to see the Nageshwara temple complex. It dates back to the Ganga and Chola periods. Unlike Someshwara Temple, the architecture is distinctively Chola. However, what's of most interest is an important historic inscription from the late 9th century that references a Bengaluru (Bangalore) war. This hints of the existence of Bangalore way before the city was developed by Kempe Gowda in the 16th century. Kadu Malleshwaram Temple (also called Mallikarjun Swamy Temple) was built in the 17th century by Venkoji, the younger brother of Maratha ruler Chhatrapati Shivaji, who ruled Thanjavur in Tamil Nadu. It was originally surrounded by thick jungle that later gave way to another of Bangalore's atmospheric old neighborhoods, Malleshwarm in the city's northwest. Apart from the fact that the neighborhood got its name from the temple, the formidable lineup of stone snake gods (nagas) stationed on the temple premises is fascinating. They've been contributed by locals as offerings for fulfillment of wishes or removal of curses. It was also important that any snakes, which may have been disturbed during the construction of the neighborhood, were placated to avoid harm to the residents. The snake is closely associated with Lord Shiva, who the temple is dedicated to (he wears one around his neck). The temple is open from 7 a.m. to noon and 6 p.m. to 9 p.m. It's particularly festive around the time of Maha Shivaratri (in late February or early March), when a week-long celebration takes place. Music and dance performances are regularly hosted at the temple too. Opposite it is the mysterious Dakshina Mukha Nandi Teertha Kalyani Temple, which was unearthed during construction in 1997. A steady stream of water falls on its idol but the source remains unknown. This 17th century temple is dedicated to Lord Venkateshwara and adjoins Tipu Sultan's Summer Palace, near Bangalore's landmark K.R. Market (known for having one of the largest flower markets in Asia). It was the royal chapel of Mysore's Wodeyar rulers, who bought the city from its Mughal occupiers and lived in a palace next to the temple. Tipu Sultan, a subsequent Islamic ruler of Mysore, replaced the palace with one of his own design but retained the temple. It's fortunate that he did so, as the thick stone pillar in front of it is said to have prevented him from being hit during the Third Anglo-Mysore War in 1791. Jamia Masjid, the city's most visually impressive mosque, stands at the end of Silver Jubilee Park close to K.R. Market. It was built in 1940, so it's not very old. However, it has elegant, timeless architecture and is made with white marble from Rajasthan. The mosque is dedicated to Tipu Sultan and a special urs celebration is held every year on the anniversary of his death. Its substantially-sized prayer hall has space for 10,000 devotees. There are also several frescoes relating to Tipu Sultan inside the shrine. In the same area, 800+ year old Dharmaraya Swamy Temple is one of the few temples in India that's dedicated to the Pandavas brothers and their consort Draupadi from the Hindu epic The Mahabharata. It's also significant for its iconic Karaga Festival, held in late March or April. During the festival, a temple priest dresses up as a woman and carries a big floral cone karaga pot through the city streets in procession. The pot symbolizes Draupadi, who is believed to return every year and bestow blessings. Banashankari Temple, on Kanakapura Road in south Bangalore, is intriguing more for its beliefs than its architecture or history. The temple was constructed 1915 by an ardent devotee of Goddess Banashankari, deity of the forest and form of Goddess Parvati (Lord Shiva's wife) who came to earth to kill a troublesome demon. What makes it unusual is that the deity is worshiped during an inauspicious time of the day (Rahukala). What's more, devotees offer prayers by lighting oil lamps made from hollowed out lemons. This happens predominantly on Tuesdays, Fridays and Sundays. It's believed that the goddess helps overcome life's hardships and challenges. On a nearby stone hill in Jayanagar, Ragigudda Temple is a landmark temple with panoramic city views. The temple was built in 1969 and is dedicated to Lord Hanuman, the monkey god, who's worshiped by devotees facing ordeals and needing help to sort out their lives. It gets its name from a gigantic pile of ragi grain that apparently turned into the hill of stone. Lords Brahma, Vishnu and Shiva are said to have visited the spot and decided to reside there. They're depicted carved onto 32 foot tall monolithic blocks. The temple complex also has shrines of Ram, Sita and Lakshman. It's open from 8 a.m. to 11.30 a.m. and 5 p.m. to 8 p.m. during the week. On weekends it remains open until 12.30 p.m. in the afternoon and 8.30 p.m. at night. The Hanuman Jayanti festival is celebrated with great enthusiasm for 12 days, usually in April. 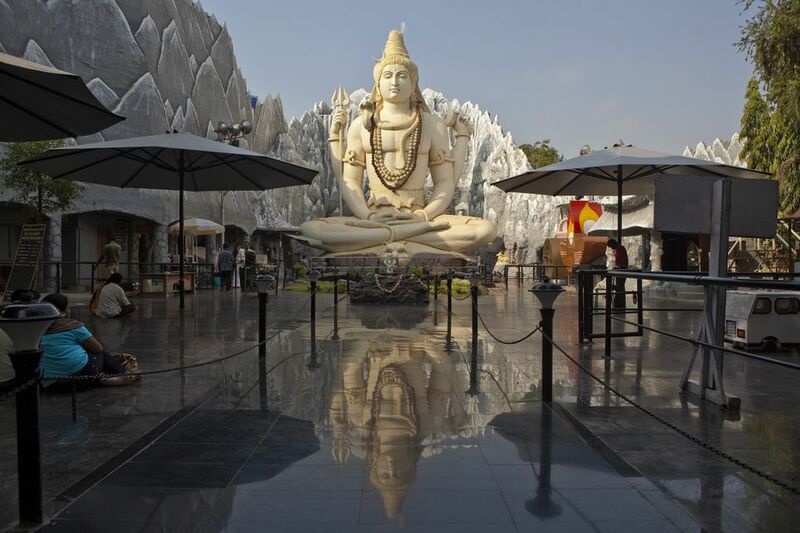 The main attraction at Shivoham Shiva Temple, built in 1995, is its imposing 65 foot-tall statue of Lord Shiva. He sits in lotus position on a tiger skin against a recreated backdrop of his icy abode at Mount Kailash. The interior of the mountain is actually a walk-through exhibit that explains all about Lord Shiva. The temple's aim is to educate seekers and encourage devotees to engage in meaningful prayer. The priests discuss the significance of the prayers and pujas with people so they understand them, rather than just perform them. The temple is located next to Kempfort Mall on Old Airport Road. It's open 24 hours and is free to enter between 9 a.m. to 9 p.m. You'll need to purchase tickets for special entry and to participate in rituals though. Proceeds go to support the RVM Humanitarian Hospital and Home for the poor and destitute. However, some people feel that the temple is too commercialized with pervasive requests for donations. Believers' Day on Monday is the busiest time at the temple, with spiritual activities all day and live bhajans (devotional songs) at night from 10.45 p.m. to 11.45 p.m.
A high-tech temple with LED and laser lights? Yes! The six giant faces of Lord Shanmukha (son of Shiva and Parvati) and their embellished crystal dome are dazzlingly illuminated at night at this rather ostentatious temple complex. The temple is a branch of Sringeri Sharada Peetham, one of four Advaita Vedanta monasteries established by Adi Shankara at the end of the 8th century. Its head guru was inspired to build the temple on a barren hill in Bangalore's southwestern Rajarajeshwari Nagar. It was conceptualized by the neighborhood's developer, R. Arunachalam, and opened in 1995. There are actually three shrines in the complex. The others are dedicated to lords Shiva and Ganesh. Features include two enormous peacock statues at the entrance and R. Arunachalam's private collection of more than 1,000 Ganesh idols. The temple complex is open daily from 6.30 a.m. to 12.30 p.m. and 4.30 p.m. to 9 p.m. However, viewing of the deities isn't possible until after 10 a.m.
Agara village, in south Bangalore, has a number of temples in the vicinity of the flyover. The most notable ones are the relatively recent Jagannath Temple, dedicated to Odisha's revered Lord Jagannath, and the Hanuman Temple next to it. The small Hanuman Temple is presided over by a towering 102 foot (31 meter) statue of Lord Hanuman, the tallest in the city. Although the temple is only open in the mornings and evenings, the statue can be seen at any time. Bangalore's oldest church, Saint Mark's Cathedral is situated at the western end of MG Road near Cubbon Park. It was founded in 1808, construction was completed in 1812, and the Bishop of Calcutta consecrated the church in 1816. Its architecture was inspired by Saint Paul’s Cathedral in London and has dome, semi-circular chancel and roman arches. Successive renovation works added different architectural styles, woodwork, carvings and stained glass. Magnificent Gothic-style Saint Mary's Basilica started out as a small chapel made by the French in 1818. It was rebuilt in its present form in 1875 and consecrated in 1882. The church is located opposite Russell Market Square in Shivaji Nagar, to the north of Saint Mark's Cathedral. The annual Saint Mary's Feast is celebrated on September 8 every year, with the highlight being an evening chariot procession carrying a six-foot statue of Mother Mary through the streets. Infant Jesus Church, in congested Vivek Nagar, was founded in 1969 and commenced in nothing more than an old tent. The church rose to prominence after the Infant Jesus was believed to have performed a series of miracles. Since these miracles were occurring on Thursdays, the day was dedicated to the infant. Now, thousands of people of all faiths come to the church on Thursdays to light candles and pray for their own miracles to happen. The church's miracle power has even been made into a Tamil movie, Kulanthai Yesu (Baby Jesus). The Art of Living International Center is the headquarters of the Art of Living Foundation, set up by Sri Sri Ravi Shankar. The center is spread over 65 acres on the southwestern outskirts of Bangalore and is one of the top ashrams in India. It teaches a breathing technique known as Sudarshan Kriya, based on ancient Vedas, to assist people in living a stress-free life. Various residential programs and retreats are conducted. There's also an Ayurvedic wellness center and pharmacy, spa, shop, cafe, boutique and library. The Bangalore branch of Ramakrishna Math, on Bull Temple Road, was set up in 1904. This monastic organization for men is a core part of the Ramakrishna Movement, founded by revered 19th century Indian spiritual leader Sri Ramakrishna (Swami Vivekananda was his chief disciple). Its teachings are based on the system of Vedanta, which combines both Hindu religion and philosophy. The Math's extensive, tranquil grounds are open to visitors and are an ideal place for relaxation. There are also some unique attractions -- holy relics of Sri Ramakrishna, a rock where Sri Sarada Devi (wife of Sri Ramakrishna) sat and meditated, and stone bench used by Swami Vivekananda. Other facilities include a library, book stall (closed Mondays), and an auditorium where discourses and lectures are held. The temple is open daily from 5 a.m. to noon and 4 p.m. to 8.30 p.m. Prayers are held at 7 p.m. The second of Sri Sathya Saibaba's ashrams, Brindavan was inaugurated in 1960 and served as his summer residence. It's located near Whitefield, about an hour east of the city center. The distinctive and controversial guru, who passed away in 2011, claimed to be an incarnation of Sai Baba of Shirdi. His teachings are focused around unconditional love and service. The ashram has a daily schedule of meditation, chanting, worship and singing.